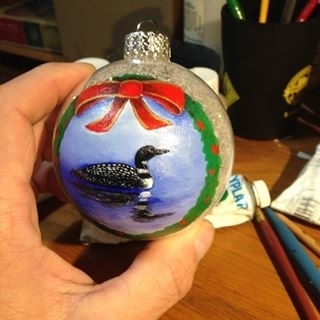 Hand Painted by Joe Baltich in Ely, MN right here at Northwind Lodge. These ornaments feature a universally popular shape that can be used for either white or red wines. Each glass is hand painted with strict attention to the finest details. If you want you put your pet in the middle just choose the customize and email us a pciture and there is an extra charge for that.